Here's a quick look at my favourite summer outfit of the moment. I don't do summer clothes well since I put on lots of weight, and finding anything that's comfortable and stylish is hard for me. I bit the bullet here though and bought this maxi dress from the Inspire range in New Look (£22.99) and fell in love with it. I was drawn to it mainly because the florals are nice and not too over the top, and I love the belt detailing, but also because it's a good length for me at 5'7/5'8. 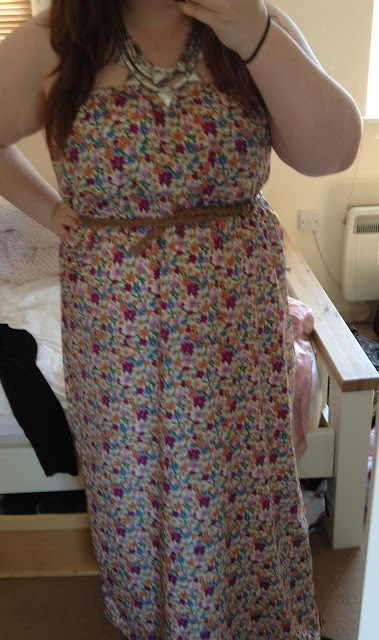 I find it hard to get maxi dresses sometimes because they can be just that tiny bit too short. 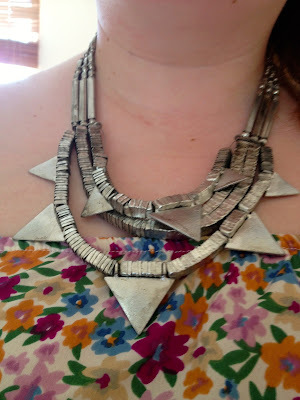 The necklace is also from New Look (£7.99) and I thought that it was so stylish with the chunky beads and layers, it looks fab with pretty much anything! What's your favourite summer outfit? I loooove that necklace! Lovely outfit! I agree, I'm a plus sized girl and finding clothes that look nice in the Summer is a friggin' challenge, especially when most stores don't even think that PS girls want and need nice clothes too. But New Look's Inspire range is really nice, a bit pricey at times, but I think they're worth! Asda have started getting in some lovely maxi dresses too and most of them go up to a size 24, so I'd deffo say go have a look in there, most of theirs are £14, so a bargain! Love your floral maxi - summer perfect!